Behind the heartwarming photo ops, USAID's projects in El Salvador are stealthily advancing the interests of the Salvadoran corporate class. The US Agency for International Development (USAID) frames its work in El Salvador in the sterile, technocratic language of neoliberalism. The agency is devoted to fostering “prosperity, security and good governance” in the small Central American nation. Notions of non-partisanship and apolitical, post-ideological action are key to this discourse. “When I see the concern and the actions of Salvadorans from all sectors of society, who regardless of their political affiliation, are determined to make El Salvador a safe and prosperous country, I feel more motivated and honored to work at USAID/El Salvador,” said USAID El Salvador Mission Director Larry Sacks as he was sworn in to the position in 2015. “Polarization is one of the biggest challenges for El Salvador to overcome,” declared outgoing ambassador Mari Carmen Aponte in her final press conference in February 2016. The State Department’s rhetorical work of de-emphasizing political ideology serves a fundamentally ideological purpose in El Salvador, where politics have long been characterized by radical social movements and robust political parties with dramatically opposing visions. After the FMLN finally won the presidential elections in 2009, ARENA’s credibility has waned considerably, not least due to the FMLN’s unearthing of myriad multi-million dollar embezzlement and corruption schemes from previous ARENA administrations. Precisely when the Left had consolidated political-electoral power, the Salvadoran right and its historic allies in the US government began to advance a discourse that portrays ideological struggle and partisan politics as passé, even backwards. The cynicism of this alleged nonpartisanship is rendered all the more evident by the State Department’s ongoing support for actors with direct ties to the Salvadoran political opposition. When it comes to development aid, these alliances with the ultra-conservative economic elite don’t just have political consequences; they have consequences in the critical life-or-death realm of public security in El Salvador. Following the so-called “Central American child migrant crisis” at the US-Mexico border in 2014 and a surge in gang-related homicides in El Salvador in 2015, a large proportion of USAID assistance to El Salvador was oriented toward “violence prevention” and ostensibly supporting the FMLN government’s security strategies. In 2016, the agency spent a total of $60 million in El Salvador, with the category of “Conflict prevention and resolution, peace and security” receiving the largest portion of funding (over $16 million). Of these funds, $10.5 million were oriented specifically towards crime- and violence-prevention projects. On April 24, Foreign Policy reported that a leaked State Department 2018 budget proposal would “end foreign aid as we know it,” merging USAID into the State Department and essentially eliminating foreign development assistance worldwide. Natsios’s frantic remarks are revealing: He essentially admits that USAID’s mission has nothing to do with development, but rather political intervention on behalf of US interests abroad. This is no great secret, but it is a fact that most agency officials in the field would be reluctant to advertise. The Trump administration’s final Fiscal Year 2018 budget request is indeed dramatic. USAID’s Caribbean development program and South America regional program would be eliminated. Compared with 2016, the Central America regional program would be slashed by 75 percent and the Latin America and Caribbean regional program reduced by 62 percent. El Salvador, in particular, would receive 32 percent less foreign assistance. The proposed cuts have doubtless sparked a panic within the State Department. But they also offer an opportunity to reckon with the purpose and consequences of US foreign aid. USAID’s violence prevention activities in El Salvador are particularly instructive. A closer look into the agency’s strategies reveals that these US initiatives are short-sighted and ineffectual at best, and at worst undermining the FMLN government’s efforts to address the roots of social violence, to the political benefit of the opposition and the detriment of the most vulnerable Salvadorans. El Salvador is no longer the murder capital of the world, but it held that ignoble title for several long months in 2015 and 2016. For the first time since the failure of a brief and controversial truce established between the two principal gangs — MS-13 and 18th Street — and the government in 2013, murder rates are on the decline. In comparison with figures from the same period in 2016, homicides today are down by over 50 percent, and extortions have fallen 27 percent. As the beleaguered population breathes a tentative sigh of relief, officials with the second FMLN administration (2014–19) point to the success of a comprehensive security plan combining enhanced law enforcement and community violence prevention strategies. “The decrease in homicides is evidence that the plan is working. But it is also evidence that prevention is one of the best strategies to achieve that,” says twenty-eight-year-old Leonardo Fuentes. Fuentes has a strong background in community organizing. He was organized in the National University’s radical student movement during his college days and grew up working with FMLN base committees in his neighborhood in the working-class San Salvador suburb of Apopa. Today, he joins the ranks of many young FMLN supporters who have been recruited into the state machinery following the party’s 2009 and 2014 electoral victories, working to provide young Salvadorans with alternatives to crime and migration. Violence, of course, is much more than homicides; the obsession with murder rates that dominates public discourse on violence in El Salvador renders invisible the gender violence, anti-LGBTQ violence, and structural violence that has historically marginalized communities and perpetuated inequalities. Furthermore, homicide numbers are a poor measure of gang violence itself, which principally impacts the population not through killings but rather through extortion, mainly of small and informal businesses. This conflation of violence with murder rates reflects or perhaps contributes directly to the impulse to respond with more violence, a tendency that Fuentes and his colleagues are working to counter. But the repression could not quell the popular demands for land, democracy, and dignity in the face of the semi-feudal conditions under which the vast majority of the population labored in abject poverty. Peaceful movements for reform and basic rights in the 1960s and ’70s were met with escalating brutality by the military regime, leading eventually to a twelve-year civil war between the US-backed dictatorship and a leftist guerrilla insurgency. After UN-brokered peace talks put an end to the conflict in 1992, it was estimated that seventy-five thousand people had been killed and tens of thousands more disappeared; over 85 percent of the violence was attributed to the regime. The period of peace, however, brought little respite from violence. The 1990s saw the implementation of sweeping neoliberal “reforms” under four consecutive terms of ARENA party rule, and with them the ideological framework that sustains such governance. As Ellen Moodie has expertly chronicled, violence was discursively transformed from political to social, from collective to individual. Homicides, even assassinations, and the emerging youth gangs all became part of a new, demobilized, depoliticized postwar framework. Unresolved traumas of the war along with the devastated neoliberal economic landscape proved fertile terrain for the US gang culture imported by Salvadoran youth deported from Los Angeles in the mid-1990s. The ARENA governments met the incipient crisis predictably: with repression. The party’s “iron fist” policies played well in campaigns, but only further radicalized the gang structures. “The crime fighting was more violent than the crime itself,” Fuentes remembers. “I was maybe ten or twelve years old when those plans were being implemented, and every day we’d watch the news and see the police come into some community and do searches. Since taking power, the FMLN government has sought to implement a dual strategy of scaled-up law enforcement control on the one hand and long-term, comprehensive strategies to address the root causes of gang violence on the other. They have taken measures to crack down on prison security and expanded the presence of security forces across the national territory, including the controversial use of the Armed Forces in police patrols. At the same time, the leftist party has overseen unprecedented increases in social spending, including critical education, health care, land, infrastructure and agricultural investment. These programs aim to strengthen the deteriorated fabric of Salvadoran society and to rebuild the social safety net that, to the extent it ever existed, was decimated by decades of divestment, privatization, and deregulation. In 2014, President Salvador Sánchez Cerén convened a Citizen Security and Coexistence Council, bringing together stakeholders from across the political, governmental, religious, and civil society spectrum to forge a consensus on a national security strategy. International agencies, including USAID, also participated in the process. The plan produced by the council, “Plan El Salvador Seguro,” (Secure El Salvador Plan, or SESP) was adopted as national policy and focuses the majority of its proposals on violence prevention, rehabilitation, and care for victims, along with some oriented towards improving law enforcement. Last year the president created a new government entity, the Vice Ministry of Social Prevention, to help coordinate these efforts. “This is the first time in history that it’s not just the police, the army and the attorney general’s office involved in security but rather all of the institutions of the state, not understanding security as just a question of crime,” emphasizes Fuentes. As part of the plan, Fuentes coordinates a program called “Actívate” or “Activate Yourself,” run by the executive’s Cultural Sec­re­tariat in conjunction with the National Sports In­stitute and the National Youth Insti­tute. Actívate helps organize arts and recreational activities for young people in at-risk communities, from community filmmaking and historical memory projects to athletic tournaments and music classes. The Actívate program is part of a roundtable on the recuperation of public spaces within the Citizen’s Security Council. Other roundtables are dedicated to expanding extracurricular activities in public schools, providing services and care for victims of crime, and creating economic opportunities in vulnerable communities, with a single roundtable dedicated to law enforcement. But while prevention is now the policy priority on paper, repression still gets prioritized in practice. The SESP is financed by a special tax on telecommunications, and the budgeting of the funds from the tax requires Legislative Assembly authorization every three months. “The majority of representatives in the Assembly are right-wing, and a large part of those representatives came out of the military dictatorships or are [former] military members, so their vision of security is always about confrontation and repression,” Fuentes explains. The escalated policing strategies have provoked concern from human rights advocates over abuses of authority and, most disturbingly, cases of death or disappearance at the hands of the authorities. “Human rights violations should not be permitted from any perspective,” Fuentes insists, but the struggle to reform such inherently repressive institutions has proven difficult. The obstacles and opposition to implementing comprehensive, long-term violence prevention are considerable. On top of the internal challenges within the security forces and the Right’s obstructionism in the legislature, the conservative Constitutional Chamber of the Supreme Court has blocked key sources of revenue for security programming, including successive progressive tax reforms and $100 million in loans for public security and violence prevention. “The Constitutional Chamber is engaging in partisan activism, and that’s clear. They are making decisions that impact the people as well as the government, they are doing electoral work [for the Right],” says Fuentes. The Right’s civil society arms, principally embodied by the National Association of Private Enterprise (ANEP) and the Salvadoran Foundation for Economic Development (FUSADES), a right-wing think tank that was actually co-founded by USAID in 1983, are leading the opposition to the SESP. Salvador Enrique Anaya, the lawyer who filed the suit against the special tax for the SESP, has a close relationship with both organizations. ANEP, despite its early participation in the Citizen Security Council, responded to the unveiling of SESP by hiring none other than Rudy Giuliani to draft a counter-proposal. But while the recalcitrant capitalist class has sought to starve the SESP, it has proven an eager partner of the US government’s violence prevention programming in El Salvador. The US government has historically funded, propped up and promoted the Salvadoran right with naked enthusiasm; only since the FMLN’s 2009 electoral victory has the State Department sought to project a degree of neutrality. Even then, US support for the FMLN’s opposition has been thinly veiled: in an embarrassing recent incident, the young man selected to preside over a National Youth Council convened by the US Embassy to “advise the Embassy on specific issues that concern this important population” was quickly revealed to be an ARENA youth leader. US development assistance in El Salvador is equally politicized. Rather than provide much-needed funds directly to the FMLN government, USAID prefers to pump millions through private companies, foundations, and third-party contractors to promote neoliberal, private sector-led initiatives that promote “entrepreneurship,” or train young people for offshore English-language call-center service work for US companies. One such program partners with Microsoft to teach Salvadoran kids English and computer skills; another links small and mid-size farms with Walmart. USAID’s Salvadoran development partners are just as corporate, and overwhelmingly opposition-affiliated. The agency boasts that it helps “artisans in El Salvador sell products in Simán stores,” a regional department store chain owned by one of El Salvador’s oldest oligarchic families and principal donors to ARENA. When it comes to violence-prevention projects, the dynamic is no different. 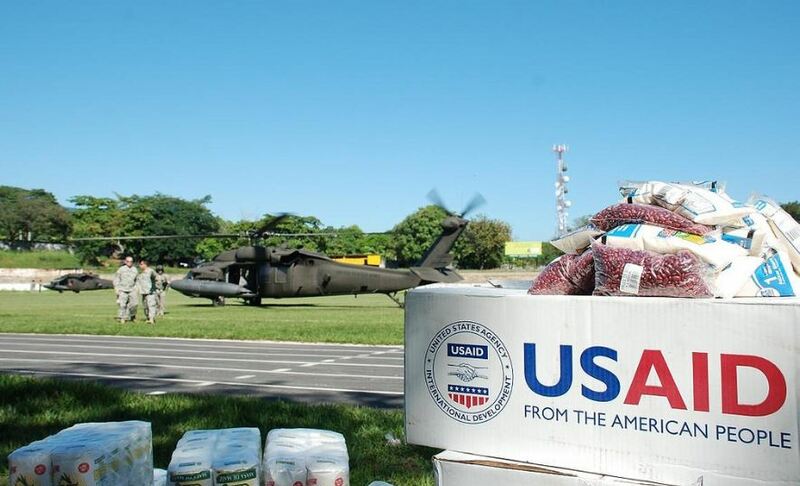 Despite USAID’s claim to be supporting the Salvadoran government’s security strategy, the agency is channeling nearly all its violence-prevention assistance through the very corporations and organizations that are boycotting the SESP. One of USAID’s centerpiece violence prevention initiatives is called SolcionES. The program is run by the Business Foundation for Educational Development (FEPADE), whose founding members include nearly every major Salvadoran corporation along with the foundations of the oligarchic Simán, Poma, and Dueñas families — a veritable who’s who of ARENA financiers. FUSADES is another principal partner of the five-year, $44 million project, $20 million of which is provided by USAID, with private-sector donors providing the rest. According to USAID, SolucionES “promotes corporate social investment to have a greater impact on crime- and violence-prevention at the municipal level,” offering activities such as sports clubs, job training, and youth leadership programs, all independent from and parallel to similar existing government initiatives. In the highly politicized Salvadoran context, USAID’s alliance with leading opposition actors like FUSADES amounts to a partisan endorsement. The management of this project is contracted to the US-based firm Creative Associates International. Creative Associates gained infamy in 2014 when its covert social media project in Cuba was revealed to be an attempt to galvanize dissidence. In Honduras, Afghanistan, Yemen, and Libya, USAID’s Office of Transition Initiatives (OTI) has contracted the company to prop up unstable regimes in the wake of US intervention — essentially counter-insurgency work. Creative Associates International in El Salvador has a five-year, $24 million project with USAID which includes the establishment of youth outreach centers as well as observatories to collect municipal crime data across a target fifty-five municipalities in total. Like SolucionES, the Outreach Centers promote a decidedly neoliberal discourse of personal responsibility and individual initiative that obscures material systems of power and oppression. One local partner in the project is the Dutriz Group, which owns one of the country’s most reactionary right-wing newspapers, La Prensa Gráfica. The company promotes USAID programs in the periodical’s pages and finances workshops with at-risk youth. According to the newspaper’s own reporting on the workshops, “risk factors [for gang involvement] include lack of identity among young people, low self-esteem, bad company and the absence, in some cases, of dreams or life plans . . . Part of the hypothesis is that by acquiring life dreams and hope in the future, young people will be more resistant in the face of negative life options and can consider better options.” For the United States and its partners, it appears, security is a matter of attitude. USAID claims to have adapted its implementation strategy for violence prevention projects to the municipalities identified as priority for the SESP, but the realities on the ground are not so neat. Fuentes tempers his exasperation tactfully, saying, “Personally, I think that foreign aid should have better communication with the government, because if not, efforts are duplicated.” But Fuentes’s frustration with the outreach centers goes beyond their territorial distribution. The SESP seeks to address structural issues of social violence through community organizing, cooperative economic initiatives, and committing state institutions to serving historically marginalized communities. The programs run by USAID and their elite donors, in contrast, have shallow roots in the communities they claim to serve. Fuentes and his colleagues in the SESP work to help communities organize themselves and develop projects collectively. This process yields rewarding results, but requires a much more challenging process of bringing distrustful populations together to identify needs and build leadership. For Fuentes, USAID’s alternate vision and methods create an unhealthy dynamic of opposition between the US-led programs and those directed by the Salvadoran government. The violence and terror generated by street gangs and organized crime in El Salvador has concrete, devastating impacts in the lives of working Salvadorans, including forcing many to risk a dangerous journey to join family members in the United States. This crisis has structural origins that can only be addressed by the dramatic transformation of a militarized, neoliberal state at the service of domestic and international capital into a democratic welfare state capable of facilitating an equitable redistribution of wealth and providing for all Salvadorans. Together with basic social programs, crucial infrastructure investments, and measures to make governance more transparent and participatory, the Secure El Salvador Plan is a key part of the FMLN’s modest efforts to begin this transformation. While advocates raise serious concerns about the government’s law enforcement crackdown, the SESP’s focus on prevention program marks a truly unprecedented turn towards addressing the roots of El Salvador’s security crisis. But with FMLN governance under a full-frontal assault from the reactionary economic elites and their servants in the legislature, courts, and the commercial media, the US government has thrown its lot in with the FMLN’s adversaries, providing glowing publicity and funding for the corporations and foundations that are engaged in a bitter war with the administration. In communities across the country, USAID’s logo is emblazoned on banners and murals alongside those of the organizations that represent the recalcitrant Salvadoran oligarchy, bolstering their images as credible, benevolent seekers of development and prosperity as the FMLN struggles to advance a competing vision of solidarity and equity. While the SESP fights to stay afloat, USAID has partnered with the leaders of the opposition to promote competing initiatives. These projects provide excellent photo opportunities for the ambassador and her corporate allies. The critical long-term needs of besieged, marginalized Salvadoran communities, however, fade into the background.